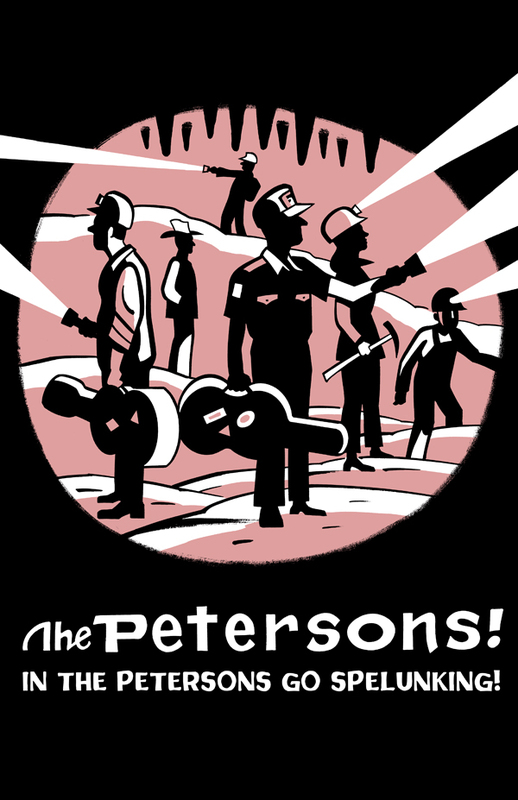 THE PETERSONS are a sextet of actor/musician/comedians who toss original rock tunes into a serialized comedy about a group of misfits from upstate New York who share a house and a stage. 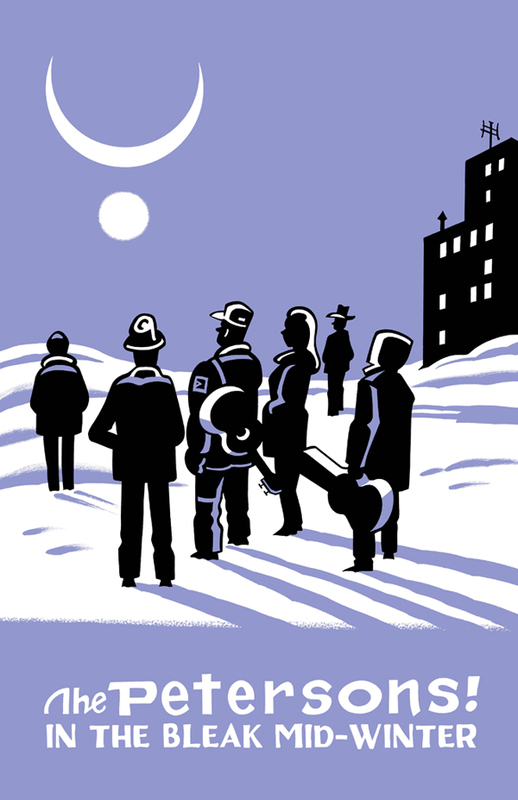 The band has performed for years around New York City at venues like Joe’s Pub, Ars Nova, Caroline’s on Broadway, the Bottom Line and 54 Below. ADAM STEIN (Mr. Peterson) currently lives in Los Angeles and writes for television (The Exorcist, Under the Dome, Damages). He’s appeared in Wait Until Dark at the Geffen Playhouse opposite Alison Pill, on Broadway in The Lion King, and at regional theaters around the country, including Steppenwolf, the Old Globe, the Guthrie, the McCarter, and five summers at the Williamstown Theater Festival. KEIRA NAUGHTON (Mrs. Peterson) appeared in These Paper Bullets! at the Atlantic Theater Company and Geffen Playhouse and in the premiere of I Saw My Neighbor On The Train and I Didn’t Even Smile at the Berkshire Theatre Group. She is a founding member of New Neighborhood. MATTHEW SALDIVAR (Julio de los Flacos) just finished performing in Daphne’s Dive at Signature Theater and recently performed in Important Hats of the Twentieth Century at Manhattan Theatre Club. He appeared as Black Stache in Peter and the Starcatcher, The Wedding Singer, Grease and A Streetcar Named Desire on Broadway, in James Lapine’s Act One at Lincoln Center Theater, and as Johnny Sandwich in the Broadway musical Honeymoon in Vegas. PETE SIMPSON (Pete Petersen) tours the world with downtown masterminds like Richard Maxwell, Young Jean Lee, the Wooster Group and Blue Man Group, and starred last fall in the controversial Straight White Men and in The Sound and the Fury at The Public Theater. In 2016 he played Angelo in Elevator Repair Service’s Measure for Measure and appeared in Clubbed Thumb’s Every Angel is Brutal by Julia Jarcho. RICK HOLMES (Ricky) played Black Stache and Lord Astor in Peter and the Starcatcher, as well as principal roles in Broadway’s Spamalot, The Visit, Cabaret and many more. He is currently on the Great White Way starring as Wormwood in Matilda. EVAN ROBERTSON (Father Tom) is a graduate of Yale University and the Juilliard School. Work created by his design company Obvious State has appeared in Elle Magazine, The New York Times, LA Times, In Style, Martha Stewart… He also happens to be a sensational guitar player. Every Petersonic theatrical experience is brand new and unpredictable…with surprise celebrity cameos! Previous guests include Michael C. Hall, Paul Newman, Tony Danza, Michael Emerson, James Naughton, Gavin Degraw, John Cameron Mitchell, Mila Kunis, and many, many others. We won’t tell you who’s in store for the next show…you’ll just have to come to find out!